We-Ko-Pa Review Part 1 — Saguaro, which is a word that took me so long to learn how to spell. The Phoenix area has plenty of 36 hole resort courses — Troon North, Greyhawk, Talking Stick, and in this case We-Ko-Pa. And if you’re in the area looking to pick one to spend a 36 hole day at, I can’t totally suggest which one to make tee times at, but playing a full day at We-Ko-Pa will never be a bad choice. I got to the clubhouse at 7, paid, looked at all the apparel they have there with the We-Ko-Pa logo, and walked out to my cart to find my bag already loaded. Time to note one of the best things about We-Ko-Pa: they have so many carts that they don’t care if a group is using three carts by themselves. Granted, golfers are usually so nice that getting paired with randos isn’t a big deal if you have to share a cart, but it usually takes a little while to become friends with playing partners, which means sitting quiet and awkwardly at 7:30 in the morning isn’t completely ideal. Oh also, you’re not required to bring the cart back after your first round, which worked out perfectly because the We-Ko-Pa carts are charged enough so they won’t run out of energy when playing the entire 36 holes. At 7:10 I drove up to the driving range which is a giant field with two levels of tee areas, really good grass, and pyramids of golf balls. Grass was in excellent condition and the range has a great feeling not only for warming up, but it also an ideal practice range. Considering I’d been hitting the ball like trash the past week (and past month really), I decided to just hit as many balls as I could before the round rather than hit a few putts to figure out the speed. This was the best decision ever for me considering I finally, finally figured out some swing thoughts and was hitting the ball way better than before. Remember people… keep your head down with your eyes looking straight at the ball, and stay in posture as much as you can, then you’ll hit it great. With that said, hitting putts beforehand is probably something I also needed to do considering I had four 3-putts that first round and thought of a GOTM Tip of the Day. While I was striping the range balls for 10 minutes, a ranger called my name and asked if I wanted to tee off at the 7:20 tee time with the players who were already on the first tee of the Saguaro course. Since I didn’t know who I was supposed to play with for either tee time, I said screw it and was off to the first tee. One thing to mention here is the length of time I take before I write these course reviews. In this case, I played at We-Ko-Pa about 3 weeks ago and I definitely wasn’t willing to write this review right away, even though I did have opinions about the course on the drive back to the AirBnB. When you do anything, such as playing a new course, going to a store to buy new clothes, thinking about changing to a new job, listening to new music artists, you’ll right away have a first impression either positive or negative. Over time, your reactions can change and there’s nothing wrong with that. Stop here before you keep reading and try to think of something that you’ve started in the past and initially loved doing, but you began to view more negatively over time. Now think of something you weren’t a fan of initially, but then became a favorite of yours. Talking about your early opinions happens so much that you need to label those as initial opinions so people know those can change. A great example of this type of modeling for reviews is YouTube user BIGQUINT who has tons of entertaining videos about his opinions of rap / hip hop albums with over two hundred thousand subscribers. If you want some examples, check out his review of Frank Ocean’s Blond(e) (I’m a huge fan of the album). The first three quarters of that video is his initial reaction to all the songs on the album with him dancing and talking about the difference between songs. During the last quarter of that video, he talks about his full reaction after listening to the album “25 to 50 times.” Another one of his great reaction videos that’s a few days old is about Kendrick’s new album DAMN. (I’m a big fan of that album too). Considering Kendrick’s album had so much hype that BIGQUINT felt the need to post a video about his initial reaction right away, he’s splitting up his initial reaction video with another one coming for his full reaction. First reactions exist, but those can change over time. Another example of the mindset is from this New Yorker article about the NYT restaurant critic, who mentions how he goes to all the places at least three times before being able to write the review. 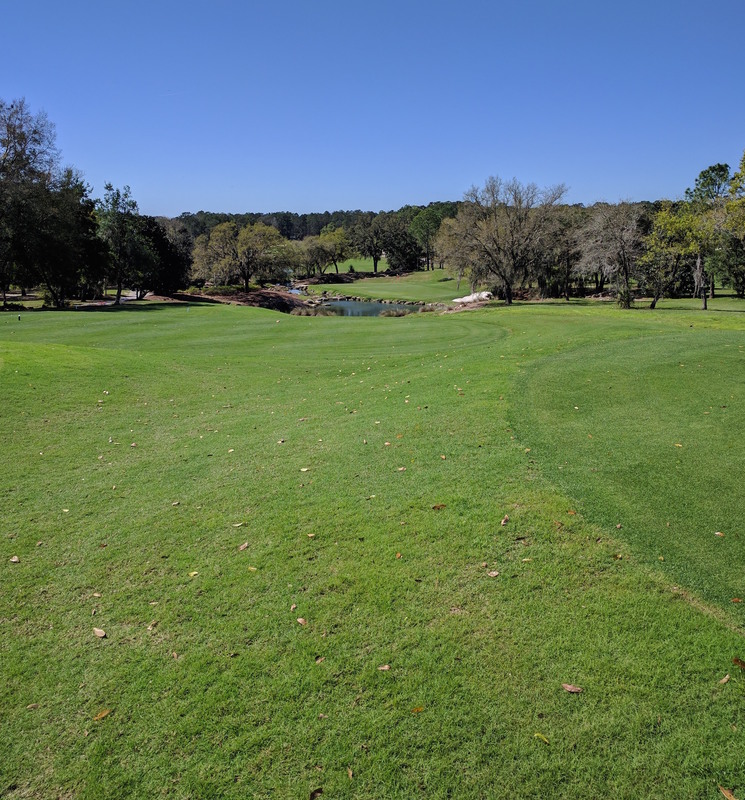 On my end, these reviews that I’m writing here are somewhere in the middle — I’ve only been able to play the courses once, (they’re in different parts of the US, somewhat expensive, and need to make sure to make tee times in multiple days), but I also take my time before writing about them so I have full thoughts and am not just talking about an initial reaction. Sometimes when I’m writing, I even imagine I’m out there on the same holes again, this time hitting perfect shots. My initial reactions count, but these articles are my full reaction. Allll that being said, my opinions of the Saguaro course at We-Ko-Pa are exactly the same as I had the day I played out there. So sometimes opinions don’t change. Time for the full reaction on Saguaro! Saguaro is a tournament style course, full of mini-doglegs that require thoughts about what to hit and where to aim off the tee, and full of changes in fairway and green style depending on how long the hole is. 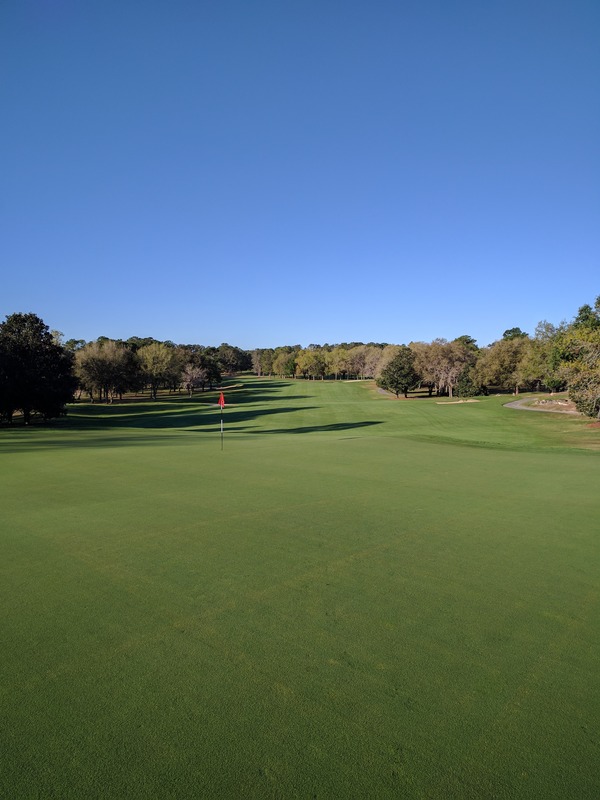 These types of designs constantly require correct planning and shot selection, which is ideal for tournaments and adds thought to a round of golf that you won’t usually find on other courses. As I mentioned just above, one of the first things you’ll find on tournament courses are something I’ll call mini-doglegs. Overall, doglegs come in two styles. The first is the ‘standard’ dogleg which you’ll often find on tree lined courses, especially up north. Hit your drive dead straight with whatever club makes you stay just short of the end of the fairway, and then hit your second shot something like 60 to 80 or even 90 degrees to the right or left. 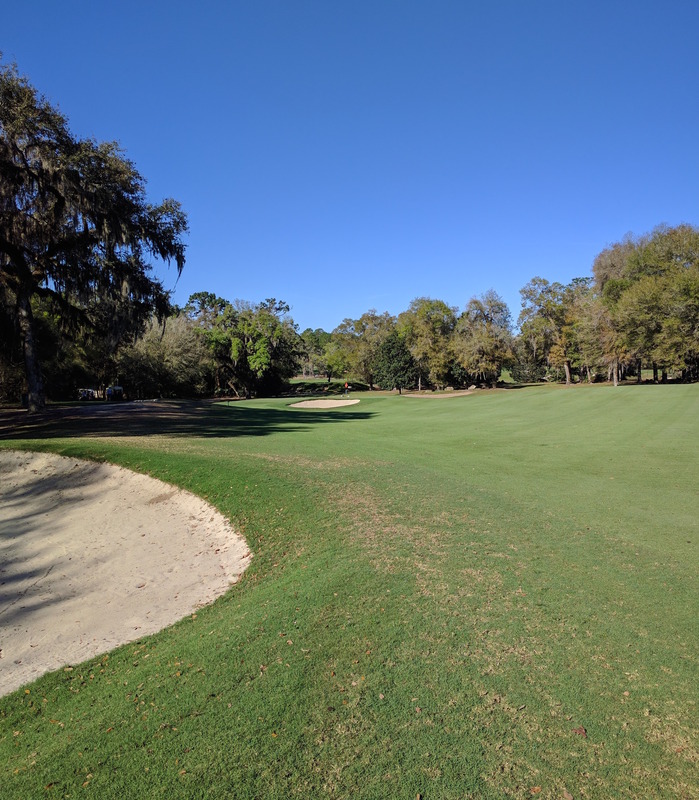 Famous examples of holes like that are number 11 at Augusta National (drivers straight since it takes a lot of driving distance to fade it around the corner), 18 at Augusta National as well, number 1 at Brown Deer (course I play all the time), 15 at TPC Sawgrass, 8 at Erin Hills (check out the US Open there this year, though there is a slight possibility for hitting drives over the hill, but keeping it in the fairway that direction is very tough).